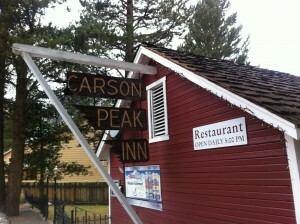 Since 1966 the Carson Peak Inn has earned a reputation for having the finest food in the Eastern Sierra. Each meal is prepared for you as you like it. Soups, salad dressings, and even the croutons are made in-house from the best ingredients. Dine in a friendly fireside atmosphere. Enjoy food at its finest, complemented by a fine selection of California and imported dinner wines.